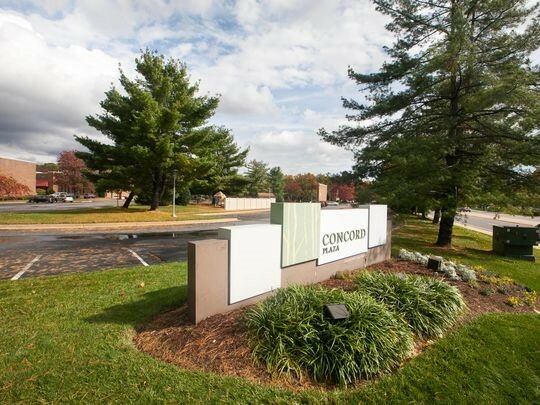 Partial redevelopment of Concord Plaza given a green light by county regulators. Here are renderings showing what the apartment and office project will look like. Councilman Bob Weiner, who represents the area, said the project’s architectural excellence and quality of construction materials will "set the bar much higher" as other pieces of Concord Pike begin to redevelop. "Concord Plaza will add a walkable, mixed-use village where residents can have the option to walk to where they live, shop, work and play," Weiner said. Walkable villages reduce traffic demands. 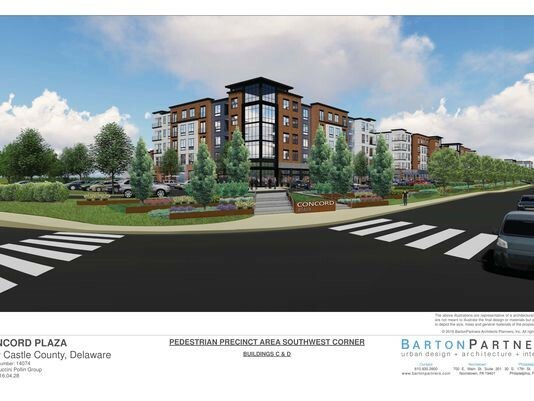 DelDOT and County Land Use department: new walkable village will not cause a failure of adjacent roadway systems. The redevelopment of Concord Plaza off U.S. 202 was given a green light by county regulators on Tuesday. The following are renderings showing what the apartment and office project will look like. 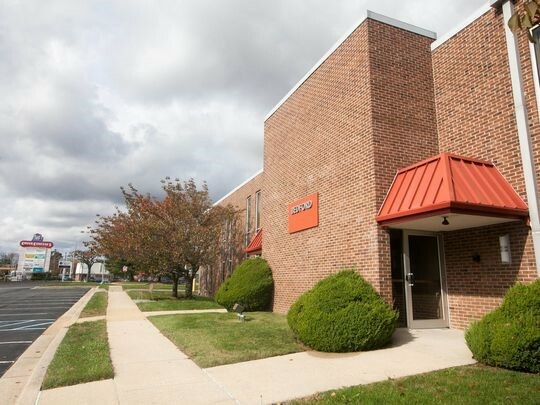 New Castle County officials on Tuesday approved plans to build apartments, stores and a new office building at the Concord Plaza office complex near Silverside Road and U.S. 202 in Brandywine Hundred. 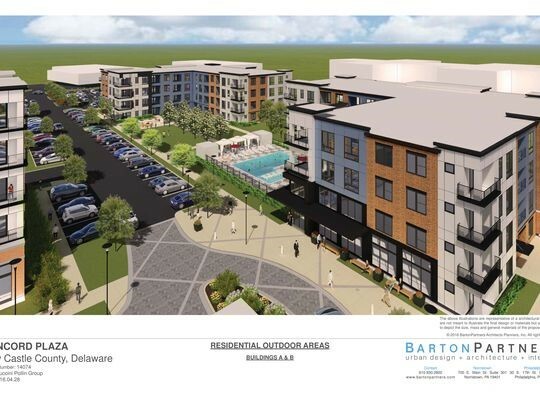 Redevelopment of the long-underused office complex was approved unanimously, and construction on the first phase is set to begin in the coming two months, said Larry Tarabicos, attorney for the Buccini/Pollin Group, the Wilmington firm developing the property. The 45-acre Concord Plaza, which was once hosted hundreds of DuPont Co. workers, currently has about 500,000 square feet of office space in 20 dated, two-story, buildings. The developer proposes demolishing eight of those to make way for luxury apartment buildings containing 341 units. Those apartments will be spread across six new buildings ranging from four to five stories. Three apartment buildings will line Silverside Road and contain space for restaurants and shops on the first floor. Tarabicos said the apartments will be upscale and include a pool and clubhouse. They will target aging, empty-nesters as well as young people employed by companies like Astra Zeneca, J.P. Morgan Chase and other employers along Concord Pike, he said. The development plan also includes a new, 60,000-square-foot, three-story office building. Tarabicos said the first phase of construction will include the three apartment buildings with retail space. That work should start in the coming months and be complete by summer 2018, he said. PHOTO: Redevelopment of Concord Plaza, a large office complex off Silverside Road in Brandywine Hundred is moving forward. Neighboring residents complained about the traffic impact on Silverside Road as well as a variance issued to the developer to build fewer parking places than what local building rules normally require. Johanna Schloss, a resident of the nearby McDaniel Crest neighborhood, said many of her neighbors fear change as the "calm atmosphere becomes retail." "It is out of character with the neighborhood quality of Silverside (Road)," Schloss said. "There are neighborhoods back there that are going to be changed because of these high rise buildings." Councilman Bob Weiner, who represents the area, said the project will "set the bar much higher" as other pieces of Concord Pike begin to redevelop. "Concord Plaza will add a walkable, mixed-use village where residents can have the option to walk to where they live, shop, work and play," Weiner said. Today, the project is one of several eyed for the busy Concord Pike thoroughfare. Developer Louis Capano III previously floated plans in 2015 to build homes and apartments on the Brandywine County Club nearby. But since a public airing of the plans, little has been said and it is unclear what Capano is now planning for the country club property. Further up the road, Wilmington University last year was granted permission to build a new campus at the intersection of Concord Pike and Beaver Valley Road. PHOTO: Rendering shows the proposed redevelopment of Concord Plaza off U.S. 202.